Hot Location Close To Shopping, Train Station, River And Downtown. 30 days or more Only! Geat walking score to downtown and the river. Wonderful 2 bedroom bungalow appointed with 2 king bedrooms and cozy eat-in kitchen. This property features a living room and a sun room for extra space. Home has a large private fenced yard for you're beloved pet. Located near the Skyline Dr. and miles of hiking trails. Close to the Royal Gorge Bridge and park, Arkansas River that has Rafting, Kayaking, and Gold Medal fishing. My husband and I have fallen in love with Canon City and all that it has to offer with the perfect weather and the year round activities. We started buying rental properties in Canon City and decided that we wanted to share our love with Canon City with other "outsiders". This is our first home that we have created into a vacation rental and we are hopeful that we can continue to make this property into something as great as it is meant to become. 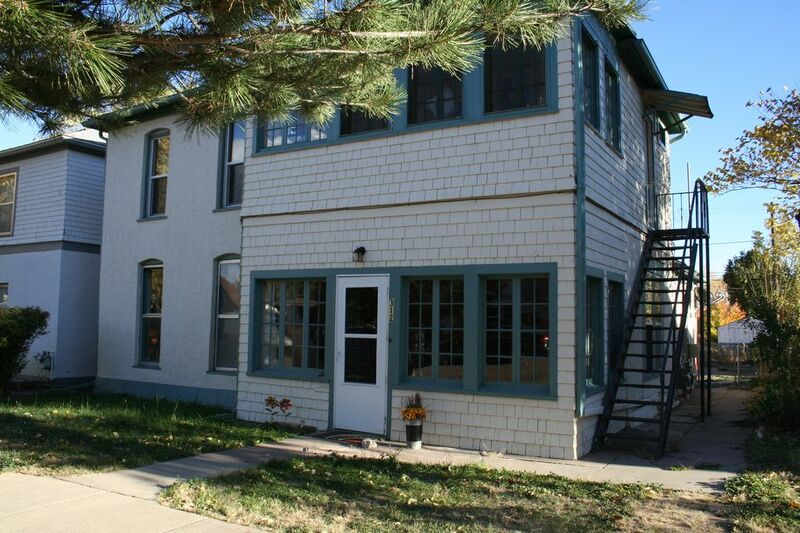 We purchased this home in September of 2014 with hopes that it would be a great affordable vacation rental for those wanting to visit this Fun town of Canon City. We used the property as a full time rental until November of 2015 when we decided it was finally time to get the property up and operational. We think this little cutie is about the nicest low cost way to stay while Visiting Southern Colorado. Affordable Downtown Bungalow says it all.. The Arkansas River and riverwalk is only 5 blocks away. All summer long Veterans Park plays host to many events from the farmers market to music on the lawn. This unit is the lower level of a duplex home. We understand what is like to "live" on the road as part of your profession. Government and Healthcare workers on PerDiem / temporary duty assignments please contact us via text/email with your dates and we will work out the best rates for you and provide the billing formats you need for reimbursements. Historic downtown Canon City hosts year round activities for visitors. From the Royal Gorge Train, Arkansas River (gold medal waters, kayaking, rafting), to great restaurants. This property sits just down the block from Skyline Drive. It was a very nice clean place. We loved that it was close to our family. The kitchen had a full line of cookware which we loved. It had very comfortable bed. It would be a great place for summer vacation. For us it was too cold in the winter that is why I gave them 4 stars instead of 5. Furance in the living room and was hard to keep warm if it was cold. We used the small heater in the bedroom which helped. If we came back in the summer I would definitely stay here. Thanks Troy and Allison for everything. Cute and clean place to stay! The place was very clean and nicely decorated.It offered plenty of room for a family of 5,2 adults and three kids.The back patio with chairs was a very nice spot to sit and relax at anytime of the day. The home is well stocked with linens, dishes,and everything you could possibly think of. The neighborhood was quiet and no one bothered us or made a lot of noise. When some issues came up with the internet,owners were quick to respond and fix it. It is a nice area with plenty of things to do for fun and had some nice restaurants.If you like big name restaurants and malls,I would suggest staying in a bigger city. Overall good experience. The home cooling is through a swamp cooler,so if you are used to air conditioning,it might take some adjusting to.I would stay again,but for a shorter stay. Comfortable stay. So close to the river and many really good restaurants in walking distance. We were happily surprised when we were told the housekeeper would be back in two weeks to clean, do sheets and towels. Our dogs loved the fenced in yard. We really enjoyed our stay - worked great for us and the dogs. Thanks for the hospitality. Lovely place to stay for a month. Super close to town and the river walk -- within an easy 10 minutes you can be to the river, to a local ice cream shop, to a fantastic pizza place, etc. Adorable house with a lot of great space that I loved coming home to every night. Every time I thought of some household item I needed, I opened a cabinet and there it was! And Troy and Allison are such lovely people! super adorable, clean, quiet, and great location! Troy and Allison are amazing!!! They were so kind and considerate, and they were more than willing to work with me when I needed to change my reservation dates. They had the lights on and music playing when I arrived, which was so welcoming and thoughtful, and they made sure I had everything (plus so much more) that I needed for my stay. They had made a welcome book that not only provided information about the bungalow, but it had great suggestions for day trips, outdoor activities, local eateries, local history, and so much more. You really can tell that Troy and Allison take pride in their rental and genuinely want you to feel welcome, to be well taken care of, and to get the most out of your time in Canon City even if that means just hanging out in the backyard grilling and sitting by the fire. I had a fantastic time and I am so grateful for Troy and Allison! Thanks a million! Royal Gorge Railroad, Royal Gorge Bridge, Bishops Castle and the Arkansas River are our favorites! Best food in town: Le Petit Chablis (French), Pizza Madness and a few great little breakfast places on Main Street.